Apparently by excluding them from my ode to the bookstore cat, I gave offense to the entire family Canidae. So before the planet erupts with little brown bags of flaming dog poo, may I extend my profound apologies to all bookshop dogs everywhere. 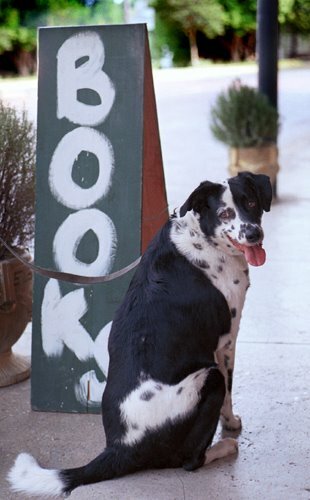 Speaking of dogs this fellow has developed a taste for Rex Stout. Zadie Smith needs a bigger mantlepiece. Margaret Rey’s collaborator on the early Curious George films has passed. And by the way, if you havent’ read the book about Curious George’s history – The Journey That Saved Curious George by Louise Borden, what’s keeping you? Simpleswap has started a Peer-To-Peer DVD, Video Game, and Book Exchange. I can’t even guess what this means to used bookselling….First we had Bookcrossing encouraging people to just leave their books wherever they finished them like empty orange peels. Now we have these jamokes just eliminating us completely from the equation. I’m gonna start taking this personally pretty soon. They are picking teams for the Google gobbling lawsuits: It’s the Universities against the Publishers. I wonder if they will have t-shirts? My book was scanned by Google! ask me how! Reportedly they can’t keep Koran for Kids on the shelves in Denmark – The Koran and the Life of the Prophet Muhammad by Kåre Bluitgen. (i’m certain there is a pun in there somewhere.) NPR has some very nice coverage of the Cartoon crusades. But for true bipartisan coverage you need to visit the Professional Cartoonists collection of cartoons ABOUT the cartoons.